At 10 years of age, Sara Eden is discovered in a sensory deprivation water bath. Her only possessions are a cheap necklace, a Walkman cassette player, a few pieces of paper and a Polaroid of a man she doesn't remember; on the back of which is a warning - 'Don't trust this man'. Sara is aware she's being pursued and in terrible danger but doesn't know why or by whom. As she sets out to discover her true identity, fragments of her memory begin to return. Still unable to connect the pieces, she knows she must find her long-lost mother who will be able provide what Sara seeks. But who is the man in the photo and why must she not trust him? 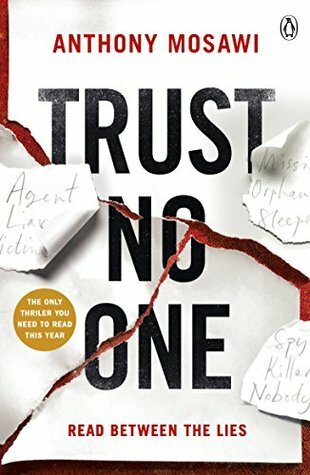 Trust No One is the debut novel by author Anthony Mosawi. It's a fast-paced thriller with an excellent storyline. However, the timeline jumps around significantly during the first half of the book making it feel somewhat disjointed. Secondly, seemingly unconnected events take a while to eventually fit together. Don't be put off though; it's a very good read, but just ensure you mentally take note of the chronology. The story is complex and imaginative; involving mind control, reconnaissance and technical jargon (which I won't even pretend to understand). Okay, so the mind control was a little unbelievable but this is fiction after all! I like my fiction to be all-consuming and this book certainly achieved that by the bucketload. My thanks to Anthony Mosawi and Michael Joseph for inviting me to read this book. My name is Sara Eden. I was born in Scotland in 1980. My mother died at birth. My father was a tourist. This is all Sara Eden knows about herself. She has few links to he past: the cassette player, a cheap gold necklace, a few scraps of paper. And a Polaroid of a stranger with one line: 'Don't trust this man'. As she begins to unravel her past, Sara discovers that she was imprisoned by a group of agents now moving heaven and earth to find her. She knows that she is important to them. She knows they consider her a threat. But the highly trained forces on her heels are only part of the danger she faces. There's something in Sara's background that is more dangerous, more deadly, than her pursuers can even imagine. 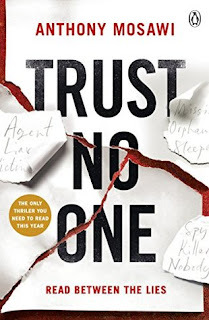 And the only thing Sara knows for certain is that she must Trust No One. Anthony Mosawi moved from London to California to join Paramount Pictures. He was on the Paramount lot for eight years before launching his own film financing company. He is married with a son and splits his time between LA and London. Trust No One is his first novel.